Almandite is a luscious, interesting gem that is also known as almandine. This beautiful species of the garnet family has a uniquely deep red colour that inclines to a hint of vibrant violet purple. The term almandite is a corruption of the word 'alabandicus', the name given to a stone found at a town in Caria called Alabanda in the Asian part of Turkey, where garnets have been cut and polished since ancient times. Almandite gemstones predominantly display a fiery, deep red hue that can sometimes appear almost black, and they also present hints of pink, brown and violet purple. With its unusually rich earthy red to violet colour, almandite is truly stunning when set into all types of jewellery items, and conveniently it is also affordably priced to suit any pocket. Almandite (or almandine) is a type of garnet or silicate mineral, which is one of the largest families of gemstones in the world. 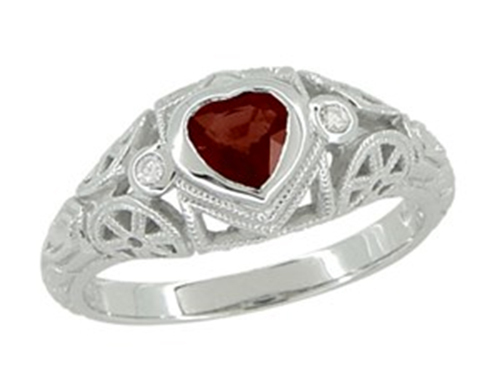 All the varieties of garnet have a common crystal structure and similar chemical composition. Almandite weighs 7 to 7.5 on the Mohs hardness scale - this hardness factor makes it an excellent choice for all types of jewellery, even rings which are subject to the most wear and tear.